Supreme Court deals blow to Obama plan to curb carbon emissions from coal. 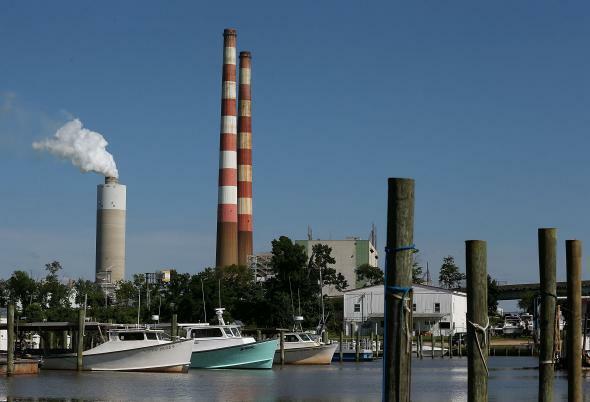 Boats are docked at the Aqualand Marina as emissions spew out of a large stack nearby at the coal-fired Morgantown Generating Station June 29, 2015 in Newburg, Maryland. The Supreme Court ruled Tuesday to temporarily halt the Obama administration plan to impose federal regulations on coal emissions from power plants, which is part of a broader effort to combat climate change. The 5-to-4 vote, along partisan lines, means that the Environmental Protection Agency regulations, part of a transformative plan to shift the American power grid to cleaner sources, will be put on hold until legal challenges to the Clean Power Plan can make their way through the courts.